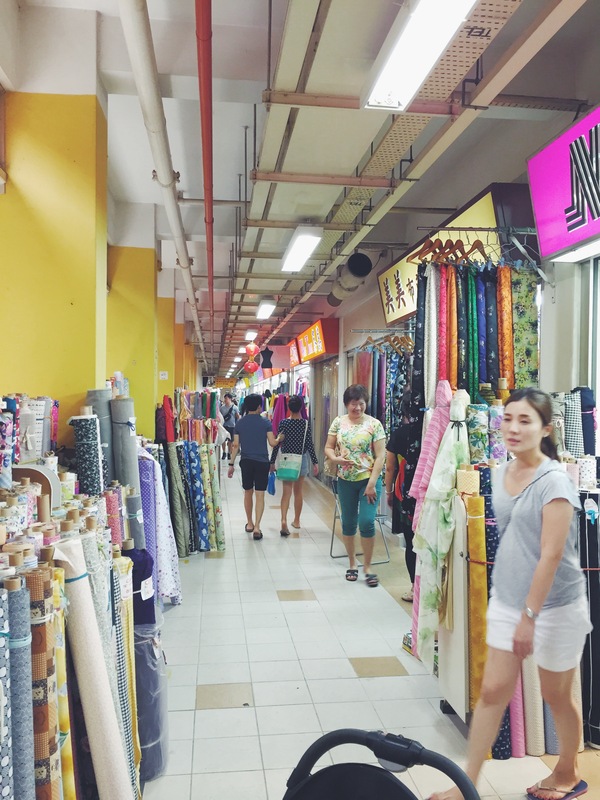 Fabric Shopping in Singapore: Chinatown – Sew What? I have written about fabric finds during my travels, but never about what is offered back at home. I have details of my favourite stores under Fabric Finds but never shared about them in details. 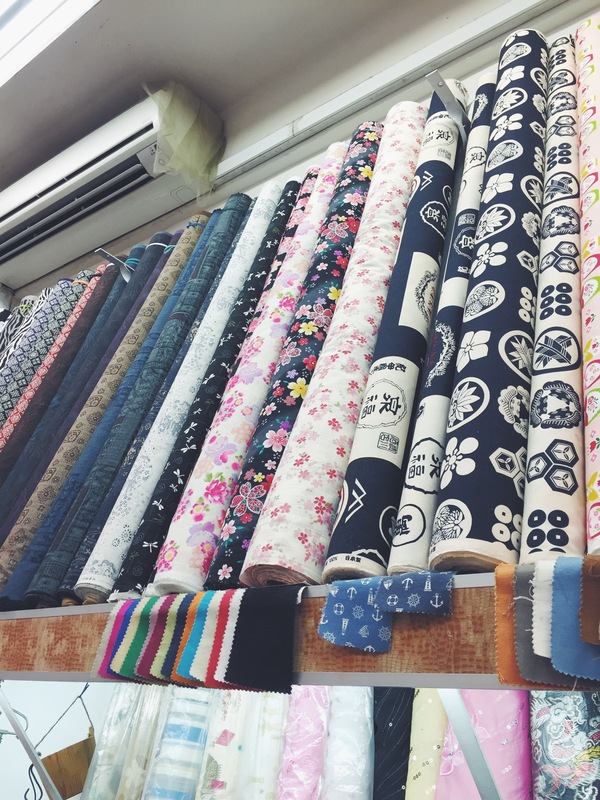 Moreover, I have a couple of friends who asked me about the fabric hunts in Singapore, so I thought of sharing it with you. 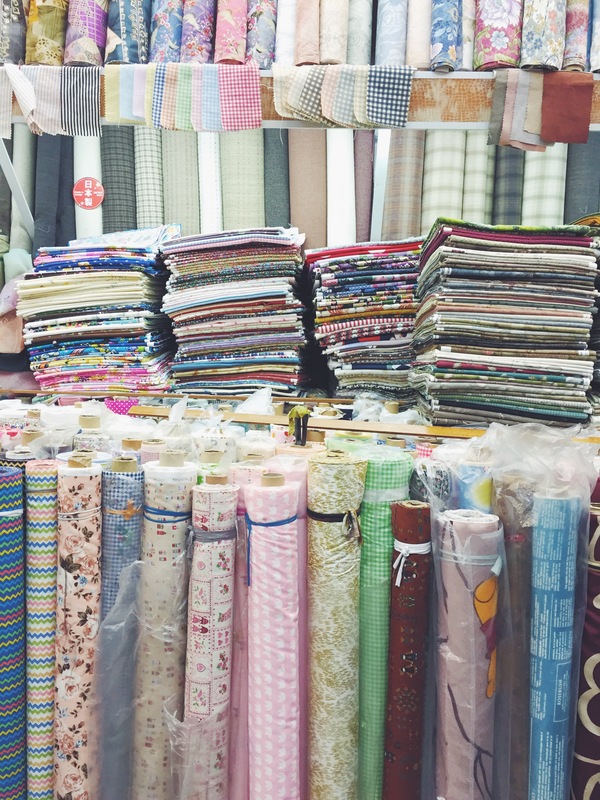 There are a few places to get fabrics in Singapore: fabric market in People’s Park Market, fabric street at Arab Street and Spotlight in Plaza Singapura. 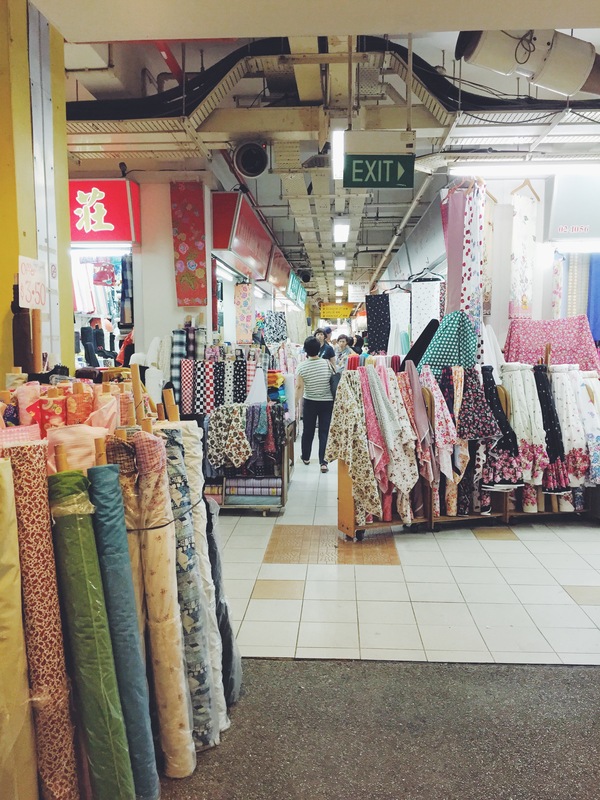 My favourite place to go to is the fabric market located on the second floor of People’s Park Market, mainly for its very affordable price and variety. So how can I get there? The nearest MRT station is Chinatown, which is on the purple North-East Line. Take the exit C to People’s Park Market. There are MANY buses that can bring you to the area but the mrt is the most straightforward. 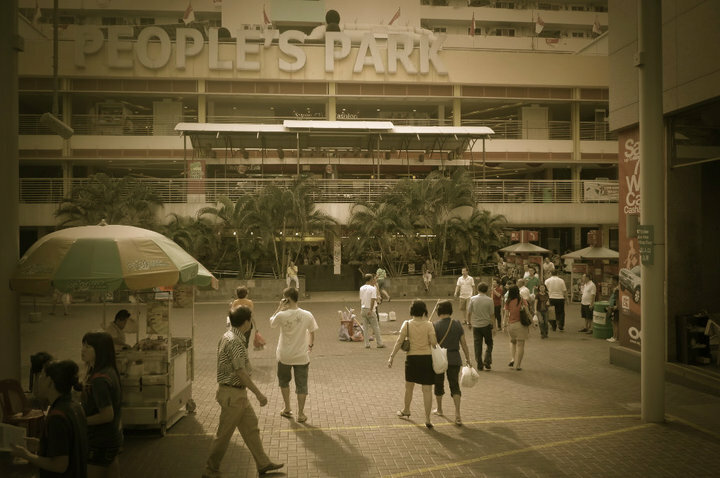 Once you get out of the MRT station you will see the People’s Market right in front of you! The second floor of the People’s Park Market houses corridors and corridors of fabric and/or notion stores. 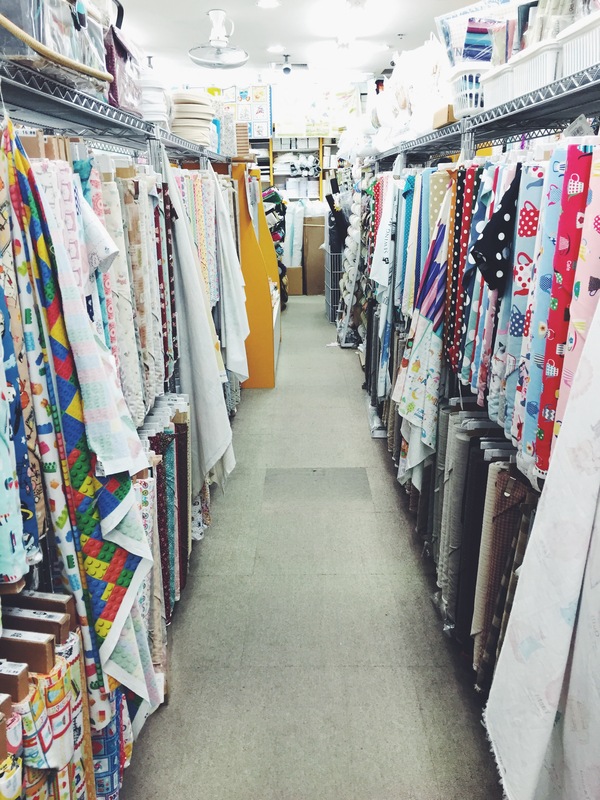 Every time I need fabric for my new projects, I would frequent 2 of my favourite stores, see what they have to offer before I go around and hunt for the most suitable fabric if they don’t have it. My next favourite is Malin Textile. Malin is the daughter of Maggie! There are 2 shop fronts but #02-1122 is the unit that I frequent the most. Unit 1134 is managed by Maggie’s other daughter, which carries a variety of Hello Kitty and other Sanrio fabrics as well. If you are a fan of Hello Kitty and other Sanrio characters, that is where you should be heading. As compared to Maggie, the Malin that I go to carries a lot more printed, sometimes cuter, fabrics which appeals to the younger crowd. She also has some precut fabrics which are in limited quantities, perfect for craft work and smaller projects such as a simple blouse or baby clothes. 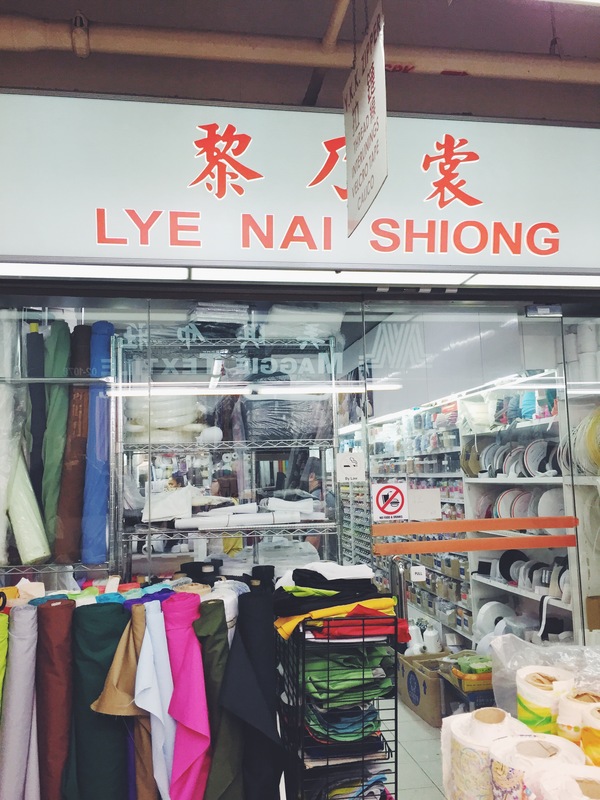 If you prefer to purchase your notions and haberdasheries all in the same building, Lye Nai Shiong is your one stop store. They are well stocked with your basics, such as zips, threads, ribbons, carbon paper, ruler scissors, pins, roller, laces, elastic bands etc. When the old Mr Lye used to mend the store, I don’t really fancy buying from him because he tends to be a little rude. You know, the kind of ‘if you want you take it, if not it’s okay’ kind of attitude. However since his son (I think. There is a younger chap working there now) took over, transactions have been smoother, and help is rendered rather amiably. Brighton is another one stop store where you should be able to get all your notions and other supplies. It carries slightly trendier products than Lye Nai Shiong. I love the variety of lace trimmings and buttons that they carry. They also have been bringing in fabrics but I have yet to checked them out. Photos are not allowed at Sin Mui Heng and I only managed to snap this with my baby in my arms. 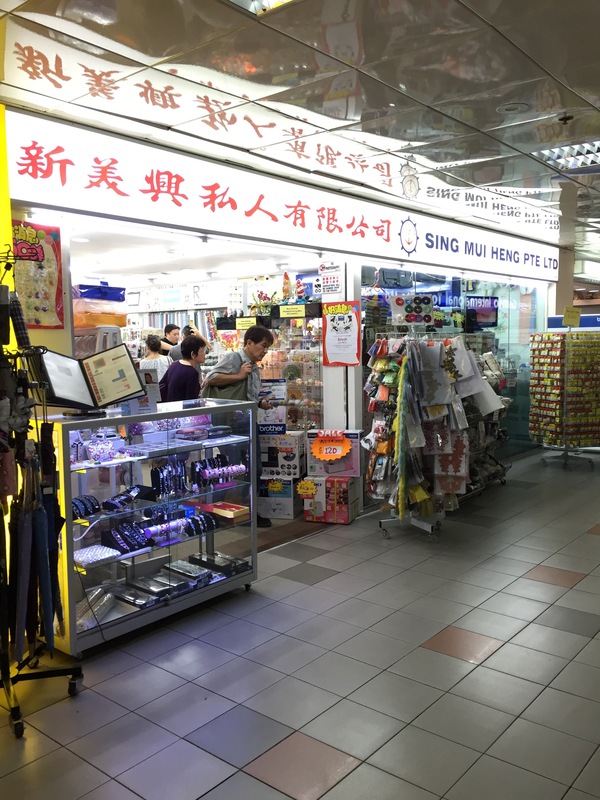 Sin Mui Heng is located in the adjacent building to People’s Park Market, across the street. However you can get there via covered link bridge from the 3rd level at the Market. I personally prefer to shop here for my notions. It’s large, well stocked, lots of staff to help when you need and I have the member card! They used to sell just notions, supplies, crystals and other craft supplies, but have expanded over the recent years to also include fabrics and quilting materials. They carry a variety of American Fabrics such as Moda, Riley Black, Michael Miller, Robert Kaufman, RJR ETC. When you can’t find your fabric and notions from all the above mentioned shops, there is one last place to go, Golden Dragon. I usually frequent Golden Dragon if I am desperate and can’t find what I want from my other favourite hunts in Chinatown. When I was making accessories rather actively (i.e. selling them as a pasttime), I buy some of my supplies from here as I can mix and match the Swarovski crystals/pearls of different colours rather than to buy them in fixed numbers. 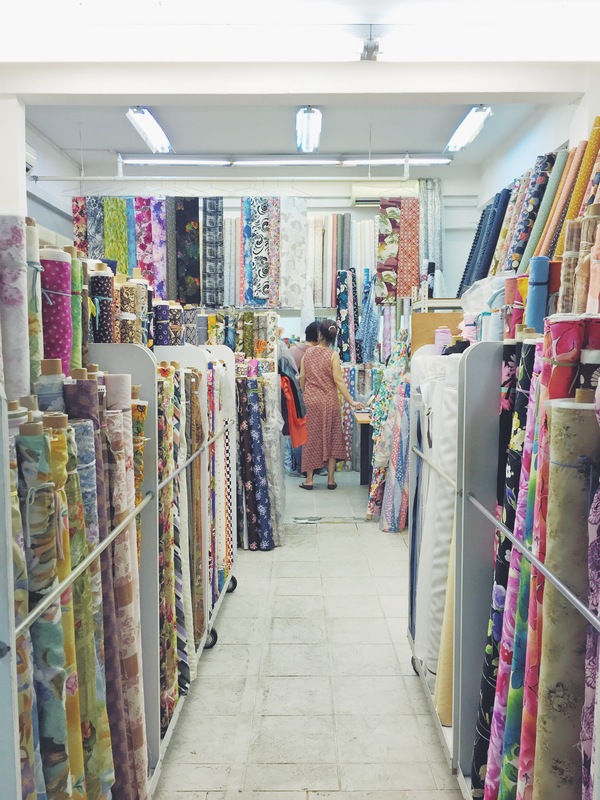 I hope you have enjoyed this virtual tour of the fabric market at Chinatown and have a better idea of what you can find in Singapore! Hi Nurul – i think they carru mostly cotton range. I have not seen muslin type. You can try Malin if Maggie doesn’t stock them. Malin might have them. They always have some secret stash. Never try never know. Good luck! Thank you so much! I have been looking high and low for this kind of cotton muslin cloth. May I know how much it is, approx.? I’m glad it is useful to you. I’m not sure the exact price of the muslin you are looking for but I bought cotton lining from Maggie at $2/m. It’s just plain cotton which you can also use for muslin. Glad to be of help 🙂 I’m not sure about ALL the shops but Maggie and Malin are, unless they have something on. Best to visit after lunch/around noon. Happy shopping! May I know whether any of this shops sell synthetic leather? I’ve tried searching online but I couldn’t locate any shops! Hello Naomi, I have seen them around before. You can try Brighton or Sin Mui Heng. Alright, much appreciated, thank you! 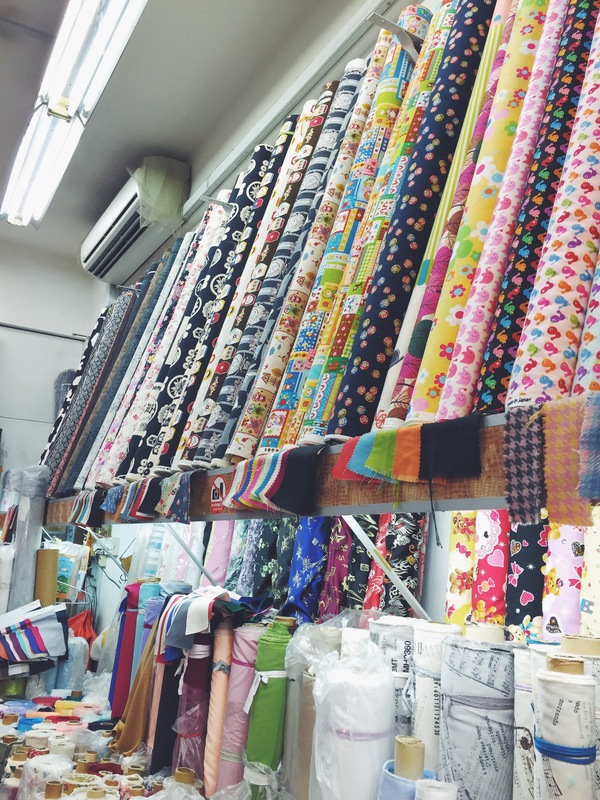 Hi, do u see any pororo fabric in chinatown? I haven’t came across any but you can try Malin, the 1134 unit. Hi, useful info! Thanks a lot! Do you know if they sell crepe fabric? Thank you Masyitah. Glad that it was useful to you. I am sure they have it but I don’t know which exact shop sells them. You might have to comb through the shops a bit to find the exact kind of crepe fabric you are looking for. I would suggest you start off at Maggie or Malin. They have a wide variety and are extremely helpful. Hi, there are 2 buildings? People’s park centre and people’s park food centre? 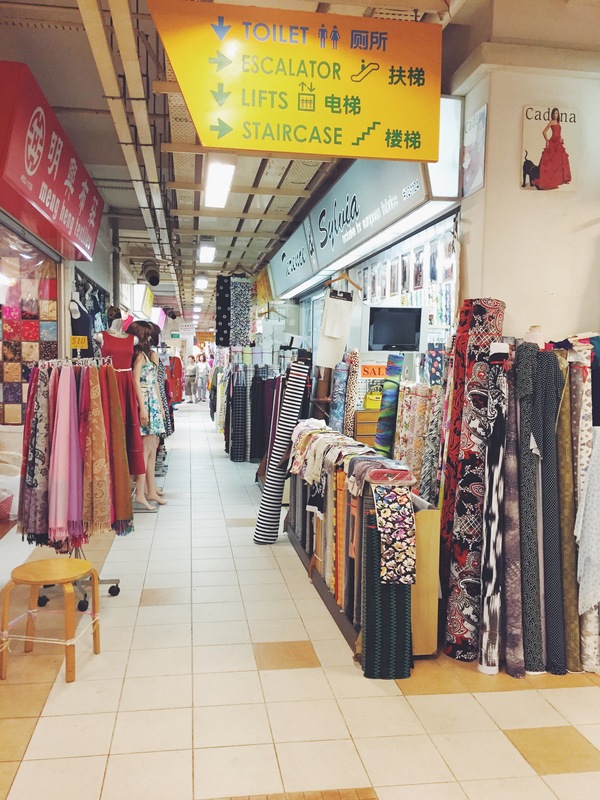 Hi Nora, the fabric market is above the food centre but there are some shops featured in this post that are located at the people’s park centre. Hi Breelyn, it really depends on what you buy. Japanese cotton generally from $12, other cotton might be cheaper. Lace and satin will cost more, depending on type and where they come from. Hi! You’re so well-informed, thank you 🙂 Do you know where I can get cheap chiffon as I would like to make an evening dress. Any cheap tailors to recommend? Thanks again! You are too kind! Just sharing where I usually go to shop for fabrics 🙂 hmmm for chiffon I really wouldn’t recommend cheap ones because it might not be of good quality. Might too thin or too sparse which makes it tear easily. You can try Maggie and Malin, they have some really beautiful plain and printed (silk) chiffons. If not, there is a Zhi Yong (or it could be Yong Zhi) that sells quality ones and lots of satin too. You might need the satin for the lining. They are located on the left side of the escalator. Are you looking for a tailor at Chinatown as well? Thanks for the recommendations! I would like an affordable tailor. Don’t have a specific place. Chinatown has? You can ask Maggie for recommendations at Chinatown if you are buying from her. If not I would recommend Regina Creations at Far East Plaza. Her workmanship is good. Hi, I’m looking for some small pieces around 1metres or under that can sale by kg/pound. Do you have any advise ? I have not come across any that sells by weight. But if you are looking for fat quarters and such you can try Sin Mui Heng. If you are looking for fabric scraps, let me know as well. The Singapore Spoolettes are having a meet up soon. I’m sure we can all collect some for you. Hi, thanks a lot for posting this! I’m currently searching for small mannequins (around doll-sized). Do you have any advice where to buy? Hope is is useful information for you. Small mannequins for sewing? I haven’t seen any around but I know Art Friend has small mannequins. Or you can try your luck at Sin Mui Heng. It’a nice to hear from Luxembourg! Are you staying near Chinatown? The fabric market at Chinatown is not huge. Unless you intend to comb through all the places that sells fabric. Email me at hunnyxpot@gmail.com. Let me know how I can help! Like what kind of fabrics you are looking for etc. First shopping trip is done. 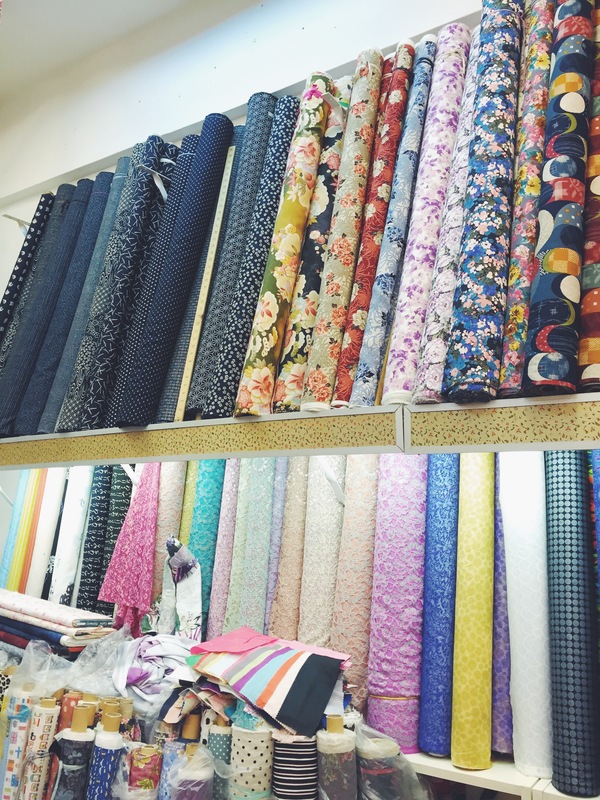 We visitid Little India , Mustapha Center.And find there nice fabrics. Tomorrow is china town on our programm ! I have been looking to replace my blanket- it is the old style plaid design (blue and white, with some orange), made of cotton. This is a simple, lightweight blanket I have been using for many years, I think it was purchased in one of the neighbourhood shops (the ones in the HDB areas, with the goods displayed outside the shops, ie on the corridors). I am based overseas now and back for a short holiday. It seems like these shops are no longer selling this sort of blanket anymore. I have tried going to Mustafa centre as well as Joo Chiat/Geylang Serai area, but their very limited amount of plaid/tartan type of cloth are not suitable for blankets as they are the very thin, harder and more rigid type of cotton. It is hard to explain but mine is like the traditional sort of blanket used for baby sarongs/to put on the baby cots. Do you know if Chinatown might sell this or where else I can look? Thank you for this post! Do you know where I can get novelty fabric like those superhero prints? Importing from the States is costly and Spotlight isn’t any better. You can try Malin. They have some superhero prints the last time I visit. Or https://www.fabric.com/. Good luck! I am looking for a cheap place to buy Singaporean or Batik material from. Would you be able to suggest the best places to check? I would like to get a few meters (if possible instead of bulk buying) and request a tailor to sew a dress for myself and a shirt maybe for my husband. What do you mean by Singaporean material? Good batik however do not come cheap, especially if you are looking for unique pieces. The machine printed ones are the cheapest, followed by stamp printed and hand painted. You might like to try Arab Street (Bian Swee Hin and Co 107 Arab Street) and Wellie Batik Fashion, #03-04 Holland Road Shopping Centre. oh ok sorry wasn’t too sure what the materials were called here. Thank you so much Tiffany! Hope it helps Jade! Oh and you might like to check our fictive fingers for local designs. Where in Chinatown can I buy 5 pieces of Red Cloth , one piece of Black Cloth and one piece of white cloth , all about 1 sq metre each and how much do they costs approximately? They will be temporary used to cover the objects meant for display. Hi Pang, you can try Maggie for really basic cotton. Less than $5 /m? Tiffany, can you help me to find where I can buy fabric for stroller city mini looks like its polyester and nylon mix, original fabric very bad quality and I need to replace all. Are you looking for something waterproof? If you don’t mind buying online, fabric.com has a wide variety waterproof/laminate included. For local options, sing mui heng might have what you want. Hello, your post was so helpful. I am looking for tulle fabric to make tutu skirt for babies, any idea if they sell tulle (rolls or otherwise ) in people’s park or not. Planning to visit tomorrow. There is! I don’t remember the unit number but it’s along the stretch where Malin is. I’m wondering what the prices are like in Singapore for fabrics? For instance in Perth, Polyester Brocade is about AUS$13 per metre and Satin ranges from AUS$10 – $25 per metre. 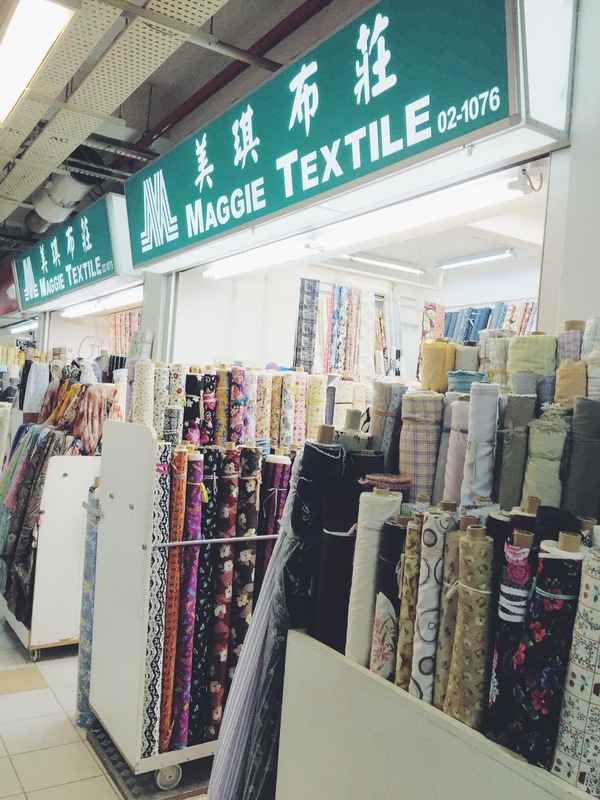 I really want to visit Singapore, but maybe KL in cheaper for fabrics? prices are roughly the same but in SGD. It might potentially be cheaper in KL but I prefer the prints available in SG 🙂 You might like to take a look at batik if you are in the region. Hi Dominique, I don’t have a specific shop recommendation but you can try Little India or Arab Street. Hi! Was wondering if you know where I could get a cloth that is about 2m or so in width? I need a 2.6m x 2m cloth to make a tablecloth and I realized most cloths are less than 1.6m? That is quite a rare width. Would it work if you stitch two pieces together? HI, (Heading to SG in July 2018) can you suggest anywhere in Sg that might be able to get quilting packs – ie Jelly Rolls, charm packs etc? Do you happen to know their approx price? Thanks in advance.